My wife and I pulled up to a stop light and sitting across the intersection were one of those once in a lifetime, only seen on YouTube moments. My first thought was, “Am I hallucinating?” But slowly I realized that the driver of the Mustang was the one on drugs. 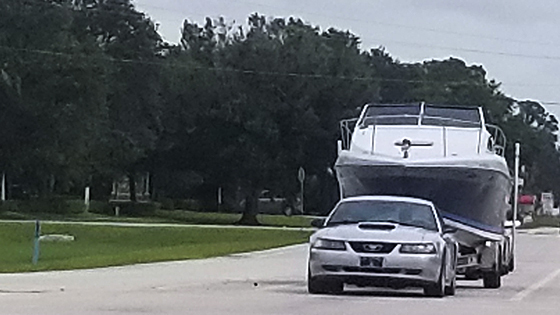 If I can use the Jeff Foxworthy bi-line, you know you’re a redneck if you use a Ford Mustang to tow a huge fishing boat. I must admit, I haven’t been able to get this picture out of my head. This image represents the single, most important quality parents must teach their kids. Do we want them to be leaders like the Mustang, fast and looking cool, but unable to tow the heavy stuff? Or do we want to raise up a generation of leaders who can successfully tow the vast responsibilities of life and leadership? Here are three keys to teaching the single, most important leadership quality. Character is the foundation on which leadership and life are built. Consequently, it is the first and foremost important thing we must teach. When we build a house, the depth and breadth of the foundation will determine what can be built upon it. A weak character will produce sorry leaders; a strong character will produce successful leaders. We need to raise up a generation of leaders. As parents, we need to understand that character is the foundation of leadership. The top scorer on the team. The smartest in their class. Like us and following in our footsteps. These are all well and good, but at the end of the day, they are just paint. Step up to do what is right, even when it isn’t popular. Character is the most important thing we teach. Then and only then, can a house of leadership be built that will tow its weight. You’ve probably heard the phrase, “more is caught than taught.” In the case of character, kids learn more from what they see in us than what they hear from us. Not only do we need to teach character, as parents we need to model character. My kids can tell you my character flaws, and I’m sure they have a long list. Not long ago I said something in front of one of my kids that I have regretted. I would love to take it back, but I can’t. At the same time, I must continue to grow and improve my character. They must see me growing, changing, and modeling Godly character. “Reputation is what others perceive you as being, and their opinion may be right or wrong. The single, most important leadership quality parents must teach and model is Character. When we do, we’ll see a generation of leaders capable of towing its weight.